The suburbs of tiny Ixian County were unmade in the torrents and floods of 2003. After the waters had abated they left behind a highway exit, a handful of roads, and little else. Four towns’ worth of ruins and a farm, abandoned to bankruptcy years before, that had gone largely untouched. That was it. The ruined barn and the decomposing silos, now home to hundreds of bats that dined on the county’s grotesque moth population, mocked us all. The mudslides, swore the relevant parties, were finished; the mudslides would never come again. Infrastructure was being built, they promised, at this very moment. Infrastructure would hold future mudslides at bay, and could perhaps even be yoked to some other sprawling plan, some sort of perpetual-motion device or industrial-strength divining rod. 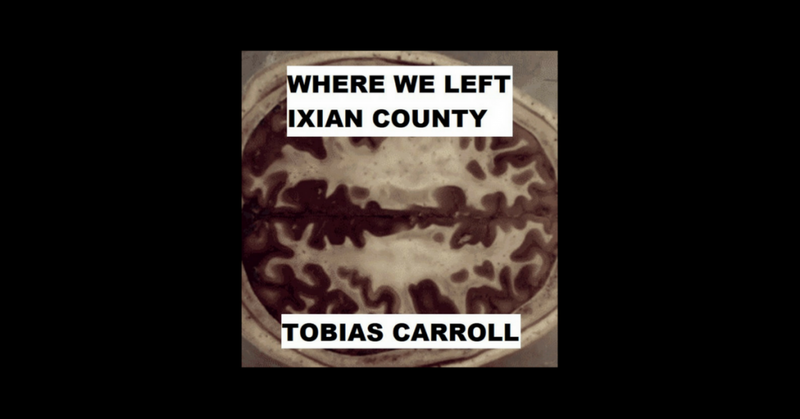 And so the municipalities of Ixian County were conjoined. Efforts to decipher this collage were heatedly debated. And so commenced the developments, the spirals, the roads that evoked cul-de-sacs but were something altogether different. This was our introduction into the future of our community; this was our introduction into some hallowed hole toward the mythic. Call it the work of Glenn Detlof, the Robert Moses of Ixian County, if Robert Moses had been a recluse with mystical leanings who dressed like an aging Gram Parsons. Concentric rings, he said, and let the silence hang. He spoke about it all the time, at community meetings and news conferences and conversations both on and off the record with members of the local media. Periodically he raised the subject in formal interviews with certain publications dedicated to progressive and eccentric strains of urban planning and architecture. Glenn Detlof looked at the received wisdom regarding how you built a neighborhood and a community and he chortled. Most people would say, housing development and housing development and housing development along a main road and along that main road you’d have your shops, your restaurants, your bars, your automotive dealerships, your magic shops, your pet stores, your trickery, your pizzerias, your bookstores, your adult bookstores, your florists, your vape shops, your other vape shops, your vape shops that first appeared to be something other than vape shops, your liquor stores, your toy stores, your furniture stores, your afterschool tutoring centers, and your institutes for distance learning. Glenn Detlof said, no. Said, here’s what we do: we put those buildings at the center and we build the houses around them. So that’s why you find the burger franchise in among the homes and lawns of a neighborhood hundreds strong. That’s why the bait and tackle shop scalded into oblivion was reborn adjacent to two modest ranch houses in a tree-lined part of town. And that’s why several residents of the Millstone Acres neighborhood could walk to their local pharmacy and liquor store and puzzle shop. Why the age-restricted housing with the interstate humming in the distance was also adjacent to the local branch of a salad chain with a cult following. We had a couple of reporters show up. We saw photographers waiting for the perfect day for a photo that would capture the arc and the full splendor of the sum total of the rebuilt community. Sometimes we’d see drones flying overhead on clear days to document the arrangement of buildings and greenery. It seemed great. It seemed wonderful. We didn’t see where it was all headed. A reporter from Dwell asked a few of us if we ever headed to the point where the streets ended, after all the homes and businesses had ebbed away. And all of us asked shook our heads. Fewer of us began to wonder. True, we did hear strange sounds in the night. Some of us. Pursuit, perhaps. Or something prompt, in search of prey. In retrospect, we’re all a little disappointed that no one said the word labyrinth when Glenn Detlof was around to hear the question. It really should have been obvious. I mean, have you seen a picture of Glenn Detlof? Picture Rasputin in a Nudie suit, and there you go. We should have been suspicious about Glenn Detlof’s designs on Ixian County, is all we’re saying. The man was, in retrospect, quite sinister. Admittedly, even as we’d looked back on his body of work, there wasn’t much precedent for the work he did in Ixian County. He’d done master plans for a neighborhood that looked like a New Urbanist Tiki bar; he’d been involved in this floating city in northern Maine that no one could be sure was real. I mean, we saw photos, but they could have been faked. They could have been models. That one guy’s shirt could have been painted on. We didn’t know. After it all went wrong, we spent a lot of time looking for the clues. The spiral designs were obvious. The branching nature of streets and paths. We lived in the suburbs; we had GPS to rely on. The seemingly random arrangement of streets was never unruly with mechanical voices guiding us. And the shops and the food establishments were all further in to the clusters than our homes. We would do our errands and get out. We never needed to proceed deeper in. But that was the mistake, wasn’t it? Maybe we might have seen the things that served as warnings. Perhaps we’d have seen the watchtowers or the pits. Perhaps we’d have seen space for an oracle, steam still rising from the ground, awaiting someone to inhale the fumes and prophesy. Perhaps we’d have wondered just how the mudslides came; we’d have wondered if Glenn Detlof had been serving the whims of some old forgotten god and had made with some sort of ritual, some kind of summoning. We’d have wondered if we lived on a new sort of altar; we’d have wondered if we were meant to be the priests or the offering. But that was still to come. Most nights we celebrated this new space. We embraced its freedom and its strange avenues and the artist who’d conceived of it. We didn’t wonder about the other things; we didn’t comprehend. We didn’t shudder in our beds, dreaming of pursuit. That was still to come.